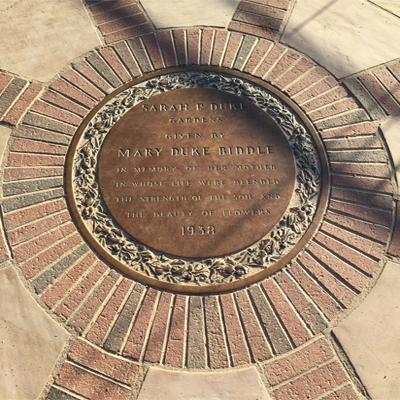 The dedication plaque for the Sarah P. Duke gardens is laid into the floor of the Terrace Pergola. It is round, made of bronze, with a wreath surrounding the inscription. The pergola floor is concrete with red bricks laid on edge surrounding the plaque which is dated 1938 although the dedication was held in April 1939. The pergola underwent a restoration in 2014. 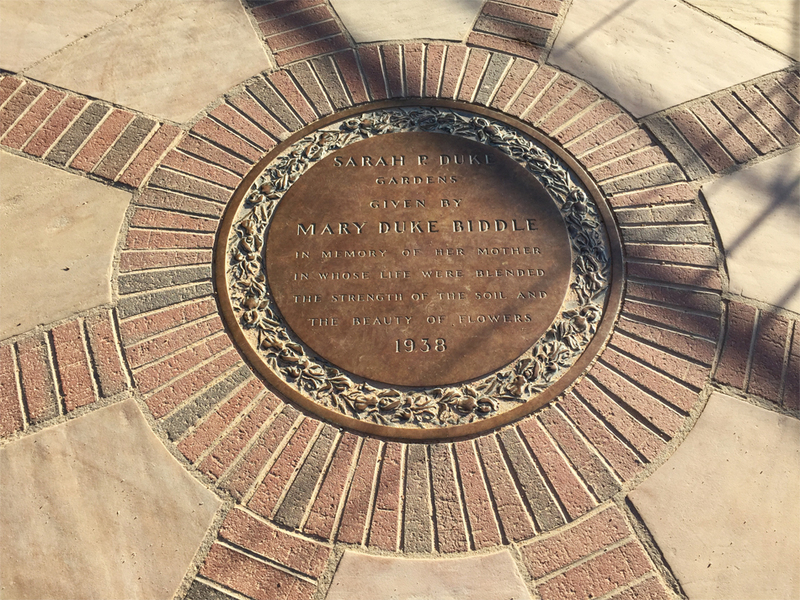 During the early 1930’s Dr. Fredrick M. Hanes, an original member of the Duke Medical faculty, convinced Sarah P. Duke to finance a garden that would bear her name. Mrs. Duke, widow of one of the universities founders, Benjamin N. Duke, gave $20,000 for a garden that was planted in 1935. The grounds proved unsuitable and by the time Sarah P. Duke died in 1936 the garden was in decline. Dr. Hanes then convinced her daughter Sarah Duke Biddle to fund a new garden on higher grounds as a memorial to her mother. Ellen Biddle Shipman, a pioneer in American landscape design, was chosen to plan the gardens. Duke Gardens is considered Shipman’s greatest work and a national architectural treasure. The landscape architect Ellen Shipman chose specific kind of flowering vine to adorn the pergola, Wisteria sinensis (Chinese wisteria.) It was planted most likely in the fall of 1938 or winter of 1939. The 2014 restoration of the pergola required cutting back the vines of iconic wisteria in order to access the metal structure itself. The new vines will take several years to grow, but when they mature, the Duke garden horticulture staff expect the purple blooms of the native Wisteria frutescens to look "gorgeous and as photogenic as ever." The Sarah P. Duke Gardens are located at 420 Anderson St., on the campus of Duke University in Durham, NC. The pergola with the dedication plaque is built near the Azalea Court in the historic gardens in the western part of the garden complex. The Terrace Gardens are one of the most popular destinations in Duke Gardens. In any season, guests are treated to a dazzling display of flowers, trees and bushes.